Lamas is a peaceful, quiet town that seems to have been misplaced. Located in the high Amazon, it has the feel of an Andean town instead, and not without reason. The residents of Lamas are believed to have come from the highlands hundreds of years ago, and have retained their customs while adapting to a jungle environment. The town still treasures its Inca ancestry. Lamas is called the "City of Three Floors" because it is arranged on three levels of terraces on an 800-meter hill. 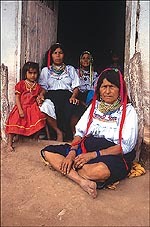 The lowest level, known as Waico, is inhabited by Indians who speak an interesting dialect that is a combination of Quechua and Cahuapana, a language of the jungle. They go barefoot, but wear brilliant, hand-woven, Spanish-style clothes; many women use pleated blue skirts, embroidered white blouses and hair ribbons, while the men wear narrow pants and short, unbuttoned jackets. Girls wear very colorful dresses, as do all Lamistas during festival times. The second level of Lamas contains trade shops and stores, and on the third level, where perhaps the aboriginal theocracy once lived, is the town plaza and the church. Soon it will also be the site of a hotel complex. Originally, the city was called Santa Cruz de los Motilones de Lamas. It is a province of the northeastern department of San Martin, whose capital city is Moyobamba, the first Peruvian city founded in the jungle. The closest city is Tarapoto, less than 25 kilometers away. The road linking the two towns is being modernized, and when finished, the 30-minute trip will be reduced by half. Visitors en route to Lamas can enjoy the thermal baths and sulfur springs in Moyobamba and the petroglyphs and lakes near Tarapoto. Both cities also have beautiful waterfalls. Close to Lamas runs the abundant Mayo River, a popular spot for canoeing. It flows into the Huallaga River, a silent witness to the adventures of Inca expansionists, Spanish colonizers and missionaries from centuries ago. It was here that the rebel caudillo Ancohualloc fled after being completely defeated by the Inca Pachacutec Yupanqui in the middle of the fifteenth century. His group went north through the mountains and the Huallaga River and then moved into the Lamas region, settling along the Mayo River basin. But there was no escaping the Incas. In the 1460s, Pachacutec Yupanqui and his son, Tupac Yupanqui, began to eliminate and conquer rebel pockets in the north, dominating the Chachapoyas, Canas, Caqaris, and finally the powerful Chimu kingdom and its capital city of Chan Chan. From there, the Inca expansion continued to the edge of the jungle, where the Inca took control of the towns of Nuyupampa, Tabalosos and Lamas, imposing Quechua as the new language. The inhabitants of this entire area, conquered and dominated by the Incas, were called Motilones, and they assimilated quickly to the Inca culture, only to encounter the Spanish little more than a century and a half later. The Spaniards finished the conquest of the native populations begun by the Incas. When the conquistadors arrived in the 1600s, they encountered the head-shrinking jungle tribe of Jíbaros, but the Jíbaro resistance did not last long. On April 22, 1650, a Spanish decree announced that the indoctrination of native peoples like the Jíbaros, Motilones, Casas Blancas, Mayorunas, Tabalosos, Lamas and others was complete, and that their numbers had been reduced.